Pictured left to right: Kyle Churchwell, Jaron Churchwell and Tori Welford. University of Southern Mississippi film student Kyle Churchwell knew he had a compelling idea for national contest. He had no way of knowing how impactful his short video would become. 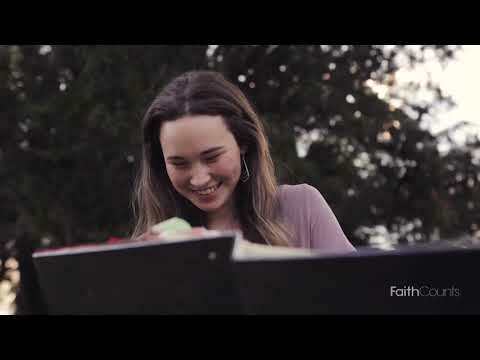 Churchwell, a Lucedale, Miss, native joined forces with his brother Jaron to enter the Film Your Faith competition sponsored by Faith Counts, a leading multi-faith online platform. The contest requires participants to submit videos of two minutes or less showcasing the power of faith in a positive light. Churchwell’s film “Faith is Knowing” captured the grand prize which included a $20,000 cash prize. His video chronicles the incredible story of fellow Lucedale native Tori Welford, who was abandoned as an infant and later adopted by a local woman. In an amazing twist resulting from Churchwell’s Faith Is Knowing, the winning film reunited Welford, with her long-lost biological father, half-sisters and half-brother. With the film posted on Facebook and seen widely in Welford’s hometown, a man reached out to her. He had watched Faith Is Knowing multiple times and saw a resemblance between himself and Tori. A DNA test confirmed . . . it was Tori’s biological father. They had lived in the same small town all along. “It is an amazing feeling to know that Tori found her biological father through a film we created and posted online. To have that kind of impact on people’s lives is my ultimate goal as a filmmaker,” said Churchwell. Faith Is Knowing recounts Welford’s remarkable life journey. She learned she was adopted at age 7, but when she turned 17, her adopted mom told her the entire story. Welford’s biological mother, struggling with substance abuse, and with her grandmother’s help, had placed the newborn in a garbage bag and then inside a trash can on their front porch. Welford’s biological brother found her hours later, covered in ants and blue from lack of oxygen, and got her to a hospital where she was not expected to live. She not only survived, but lived to tell a remarkable story.